We have the perfect lectern solution for customizing logos for your institution or presentation slideshows. 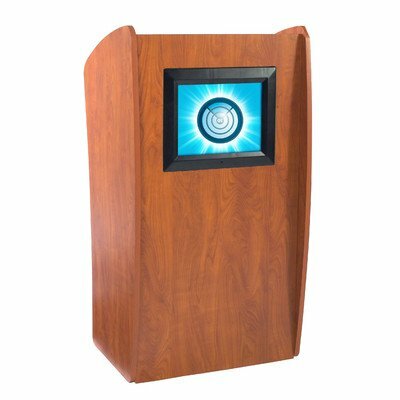 This lectern has been designed with a sleek curved shape in a modern cherry laminate, which provides a contemporary look for a variety of venues, The Vision is furnished with breakthrough technology; a 15" LCD screen built into the front of the unit. The screen has the ability to display images uploaded with a SD-card or flash drive. It includes a remote control, allowing the presenter to switch to various preloaded images with a touch of a button during a presentation or between speeches. This integrated system can be used to display customized logos for schools, hotels or places of worship. Additionally, it enables a speaker to bring a presentation to life by displaying diagrams and photos for the audience. Measures 24" width by 46" height by 21" depth. Wild cherry color.